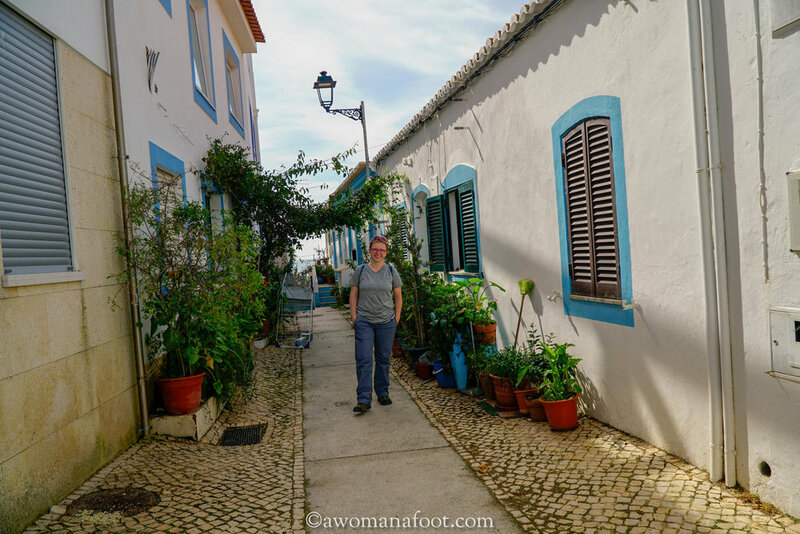 The next section of my hiking adventure on the Via Algarviana trail in Portugal took me from Barranco do Velho, through Salir, Benafim, Alte and a rest day in Messines to Silves. 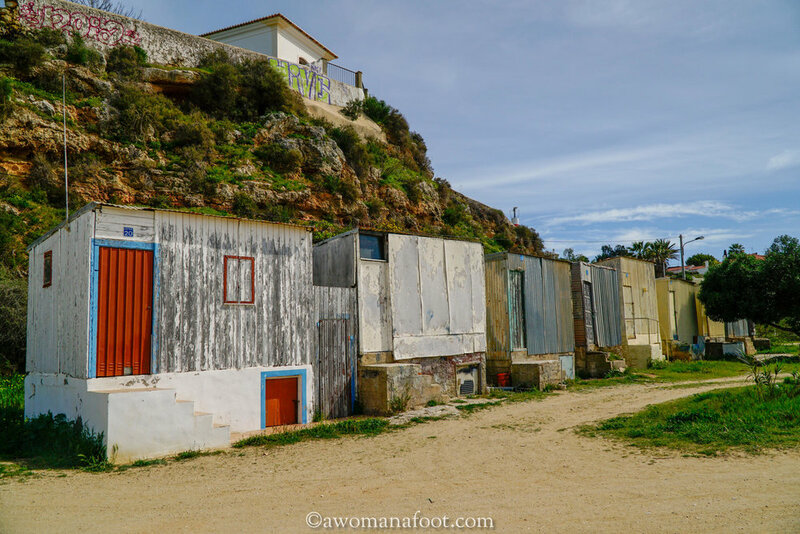 If you just found this blog - you might want to read the general overview (and why it’s an awesome trail for solo hikers) of Via Algarviana, as well as the first stage - from Alcoutim to Vaqueiros, and the second stage from Vaqueiros to Barranco do Velho (the one with the dog). I left Barranco do Velho not only with a refreshed body but most importantly - with a much lighter soul and happier mind. When I went down for breakfast that morning, the manager told me that the puppy was gone. I didn't understand well if it was the owner who picked him up or if someone else took him home, but the most important thing was, that the dog was safe and not with me. The trail from Barranco was fantastic. Beautiful, not too challenging but undulating enough to make it interesting, with great views. Wherever I looked, I loved the natural compositions of reddish soil, cork oak trees, pine trees bushes and wild flowers. I could also hear birds singing and buzz of insects, absolutely marvelous. Along the path, there were wooden educational boards with Portuguese and English information on the area flora and fauna. If you are in the area and have just a few hours to spend - the walk from Barranco do Velho to Salir is just beautiful and very interesting. After a few hours of great hiking, I reached Salir and was happy to stop for lunch. As usual, I got an omelet with french fries, the easiest option for me, as I'm on a gluten-free diet. The restaurant was on a hill and had a fantastic view from its windows. I checked out the local store, but there wasn't much I could buy. I got some bananas and oranges (they are heavy, but I love them). Now the plan was to leave the town and find a suitable spot for a wild camp. The problem was that Salir seemed to go forever with farms and tiny villages. The sunset was getting closer, and I worried I would have to look for a place in darkness. I went off the main village road in hopes to score something slightly hidden from people. The cool thing on this path were the many old-style wells with huge wheels. I’ve read this kind of wells was the main source of water in the rural areas and some of them seemed to be still in use. There were hills all around, so it was also not easy to find something flat. Finally, I saw terraces made into a hillside and decided it must be it. They were far from flat, and it was hard to find something at least somewhat flat that was not covered with rocks and debris. I pitched the tent and was about to settle inside, but when I tried to press the floor down over plants, thorns of some thistle plants got through (and into my skin). There was no way I could sleep on it! Not only I would be filled with the thorns, but my air mattress would also be dead for sure. So I quickly took the tent down, put the backpack on again and rushed to find a better place. Finally, I settled on a flat area, pretty close to the road, but at least free of thistles and rocks. I hate camping so close to a road, and I just hoped it wasn't used much by the local farmers. The night was, as usual, cold and damp. So the next morning I had to deal with the added fun of mud. There was a considerable condensation but as the day was gloomy, there as no sense to wait for sunshine. I just packed it all (red mud, too) and moved on. I planned to eat just a banana for breakfast and stop in Benafrim for a coffee. The walking was hard. Even though the trail was not steep at all, I felt as if I was hiking through the Alps. My feet started to hurt very early on. This is a recurring issue to me, but most of the time the pain begins later in the day. This day the heels and big toe caused me a lot of sorrow already early in the day. Pretty soon after leaving my camp I rejoined the trail. It took me up a hill and then lead on the ridge, on a newly made gravel path. It provided nice views of the vally below and hills on its other side. When I reached Benafim, I walked around the town a bit and stopped in a restaurant called Hamburgo. It was just before noon, so perfect for staying for lunch. The omelete with french fries was delicious, and I hoped the next part of the day would be easier. Unfortunately - not so. I and I felt weak. When I reached Alte - my goal for the day - I could hardly walk. I stopped at a pharmacy and bought a pain-killer cream for the feet. Alte itself was a lovely white town with the traditional joyful color accents, with cobbled streets, and charming cafes. When I saw my hotel was away from the center, and I almost cried. I had to walk up the main road (with no space for pedestrians), and the only thought that kept me going was the booking's information that they had bath tubes. So I walked on. And then there were long stairs. When I finally reached the reception, I was half dead. 37 km; total ascent: 570 m; total descent: 860 m.
The breakfast at the hotel was fantastic, and I was in high spirits. A lovely lady at the hotel let me through their back gate which opened directly to the Via Algarviana trail. I could see clearly how much the area around Alter differed to the regions in the East. Now I walked through affluent neighborhoods, huge orange plantations, beautiful houses and it is evident that it was easier to be a farmer here than in the mountains near the Spanish border. The weather was superb and summer-like. It also seemed that this section of Via Algarviana was more popular with day hikers and folks who did 3-5 days. I am not really surprised - it's easier to get to, and there was much more infrastructure and accommodation available. I missed the more wild areas, though. Throughout the day I could continuously sense and see there were towns and villages nearby, I never felt the complete solitude as in the earlier sections of the trail. Somewhere mid-day the trail takes one near a huge viaduct with a highway. My feet hurt again, and the fact that I had to walk on tarmac didn't help much. I assumed that’s how the trail would be all the way to the town, but suddenly it took a different turn. As if by magic, I now walked on a path through a green gorge, with a stream and thick growth. It was a lovely break before reaching a paved road again, a tiny bit of wilderness in the industrialized area. I knew there was a hostel in São Bartolomeu de Messines, so I went on to find it, which proved much harder than I thought. The hostel was not a regular one, with a reception and so on, but rather a floor in a local community center. I was lucky, that when I reached the center, they had a sporting event going on with a lot of people. I started to ask about the hostel and the lovely people, instead of turning me away, got their phones to find the responsible person. It took a while, but I got into the room and could leave the backpack. I went to do shopping in the supermarket nearby, where they had a cafe and also a laundromat. I was pleased about it as my clothes were nearing the bio-hazard stage. I’m the queen of this hostel! I had the hostel all to myself. I got two nights, and as it was a weekend, there would be no one around the next day. I got my fingerprints registered and could enter the building thanks to a print reader. There was no kitchen on the hostel floor, though. Just the rooms with bathrooms. There was a big kitchen downstairs which was used only by the school, but there was a microwave. I asked for an electric kettle and got one - but for whatever reason whenever I tried to turn it on, it blew a fuse! It came from their office, so I don't know how they could use it. I tried it on my floor, and then in the kitchen - no matter, I had to turn the fuse on (it's good I found the fuse box and figured out which one was the responsible one). So this was a fun day off. I had the big building to myself, and it felt a bit weird. The next day was really sunny and warm, I dried the tent and did laundry. I walked around Messines taking photos, I loved the mixture of old village streets, with tiny houses and half-ruined structures, and newer and more well-taken care off parts. There were also brand new neighborhoods, and it's obvious the town is growing. 22.7 km; total ascent: 400 m; total descent: 527 m.
One swell of a day! The next day, with clean clothes, dry tent, and fresh mind, I moved on toward the artificial reservoir on the Arade river. The trail takes it time to reach it - first I had to walk through rural areas and the village of Pedreiras. Then, after a longish climb out of the village, suddenly the view opens wide to hills, mountains, and the lake. 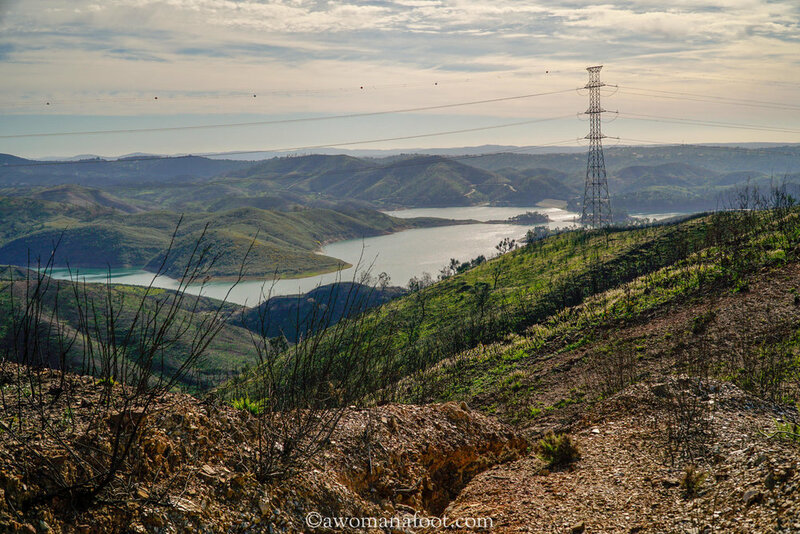 The trail hugs the reservoir, and most of the day I walked with the lake steadily on my right, with the ever-changing hills and mountain slopes. The path is wide but not naturally - the whole dirt road was dug into the hillsides. If anyone hoped for a wild camping spot around here, it would be tough to find one other than on the road itself. At one point, the trail leaves the lake, turns inland and climbs a hill. The next time we are close to the water, we are high above it and ready to turn toward the road leading to the dam. At one point, I have sensed a weird itching in my arms. I thought that maybe I got a sunburn (it was really sunny)- the skin felt stretched and itchy. But then I saw my wrist was swollen. I stopped to look closely, and I was surprised to see that both my forearms, wrists, and hands were swollen. I know hands sometimes swell when hiking, but I've never really experienced it. First, I decided to put the trekking poles away, but it didn't really help as I still held my hands down. So I made an effort to hold onto the straps on my backpack to keep them elevated. When I reached a picnic spot before the dam, I stopped for a break. This was the first place with some flat and grassy area for a possible wild camp but extremely exposed, right next to a road. There were two cars parked there, and a group of tourists enjoyed the stunning view. I decided there was no sense to risk someone checking on me and the anxiety of waiting for someone to check on me. So I moved on. The dam was not huge, but it was fun to walk through it. I am not sure about you, but I always feel a bit weird when I step on such constructions. There is the tiny sting of anxiety, of the "what if" thought of total catastrophe waiting to happen. I wanted to find something for a wild camp after the dam. I knew from the map that there was supposed to be a stream or a river. The river coming out of the dam was definitely strong enough to gather water. The bigger problem was that it was flowing through a deep gorge and it would be hard to get to it. So I walked on in hopes of finding the right spot to get water and pitch my tent. The area was hilly and also looked damaged. There were massive wildfires in recent years, and you could clearly see it. The hills around me were very steep, and wherever I looked, I couldn't see any place for the tent. I was worried about water, so I filtered some from a deeper puddle I found. It looked better than the green-yellow pond nearby. And so I walked on, now with plenty of water to get me through. After a tiring climb, I reached crossroads. The sunset was near, and I started to grow anxious. But I was lucky - I found a lovely spot on a hill, not far from the trail. As it was implausible for anyone to use the paths, I didn't care it wasn't hidden much. I settled and could admire the hills surrounding me all basked in the golden light. I even had visitors! Two deer came running, and a dog chased after them. I took a few rushed photos, but it was hard to capture them. A few minutes later they came back, and that time I got better pics. I went for dinner to the local restaurant with a fabulous window view to the mountain and setting sun. I can highly recommend that kind of establishment! The evening was cold but dry and windy. After enjoying the beautiful sunset, I snuggled in my sleeping bag and read myself to sleep. I woke up early in the morning and enjoyed seeing (and capturing) the dawn. I rarely wake up that early, but when I camp, my body senses the rising day, and sometimes I am up to see the sunrise. The morning was still cold and windy, but I was happy to notice there was no condensation. I ate a banana for breakfast and decided not to make any coffee, as it didn't seem to be all that far to Silves. The area before Silves was very dramatic. Beautiful mountains and stunning views but also deep wounds from wildfires. Blackened branches were everywhere, although Nature was slowly recuperating. There were many dirt paths crisscrossing the hills. Many trail signage was destroyed - either burnt partially or entirely gone. This was probably the reason why I missed a turn. When I noticed another dam and water reservoir, I felt it was odd. I checked the ViewRanger, and indeed I was 1.5 km off the trail. I had two choices: either walk back to where I left the trail, or find a shortcut to rejoin it. I decided on the second option, and it wasn't my best day for making such decisions. Both the main trail and the road I was on at the moment, were located on top of hill ridges. The shortcut would be like closing a triangle, but the path had to go down to a valley and then back up to the other side. Additionally, on the map, all the tracks looked the same - but the shortcut proved to be unused and overgrown. After an initial part of "not too bad" I had to walk down on an almost vertical incline. It was crazy steep! Burnt branches were all around me, and my backpack and my arms were soon covered in soot stripes. I felt it was a miracle I didn't fell on the steep descent. After a moment an ascent started, and it was really long. I cursed myself multiple times that I didn't just return to the trail on the main path. Hiking that day was really hard for me - not just because of the tough shortcut. I think my body was just exhausted and the one day off in Messines was not enough. I was also tired mentally. Although I walked through beautiful areas, I didn't enjoy it as much as I usually would. I kept pushing more out of duty than for enjoyment. When I thought I was almost on the path to Silves, I've noticed the track wholly flooded. I could either take my boots off and cross it, or try and go around. I went with the second option and struggled through thick bushes and reeds to get on the other side. 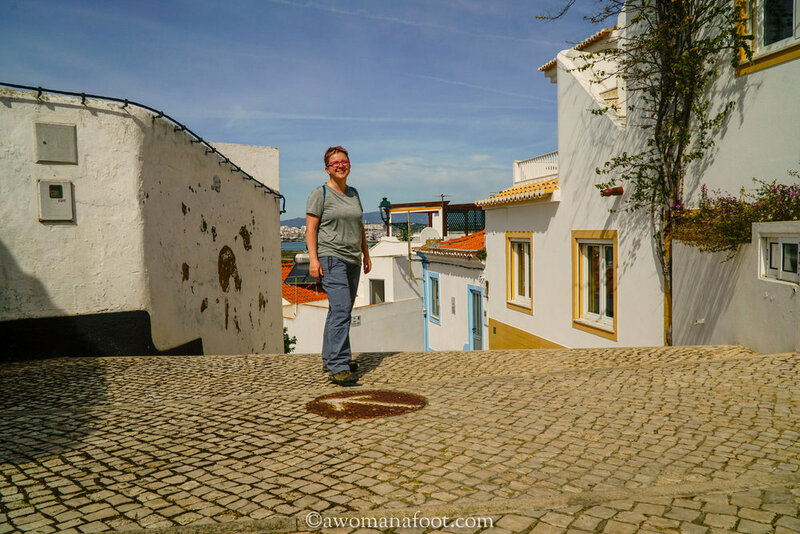 With the help of ViewRanger, I left the trail to reach Silves. The guides say that there is “bare 500 m” to the town, but what they mean are the city lines, not the center. To get to the hostel, you need to walk for 2.5 km which is not easy when you are already tired! On my way, I saw several storks, including one nesting on a palm tree! That's a first for me! The hostel (which I highly recommend) was on the other side of the river, across a bridge. The building looked neglected with one section a ruin, but inside all was clean and comfortable, with a cozy feel. I decided on taking a day off (which ended up being two days off). 1st day: 18 km; total ascent: 793 m; descent 734 m.
In the end, I spent two days in Silves and it was the right idea. 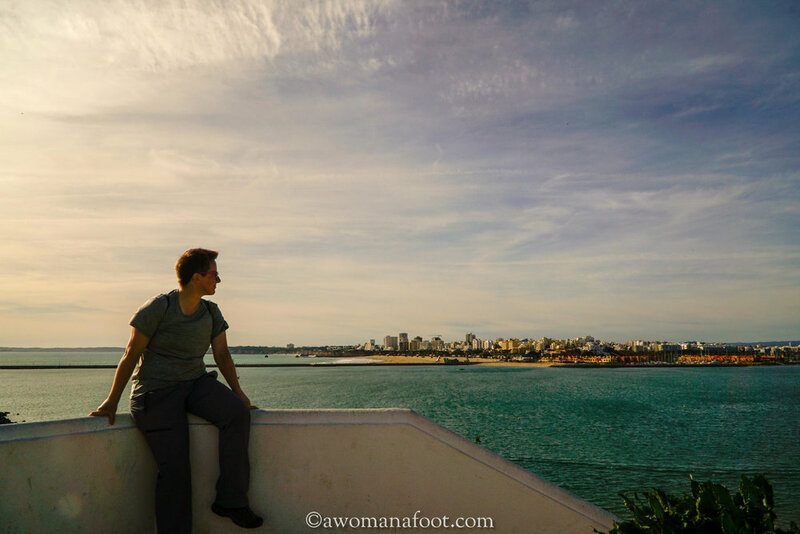 Even though I was pretty active during these days - sightseeing Silves and making a day trip to the Ocean, the break from hiking seemed to do the trick. It refreshed me physically but also mentally. I felt somewhat down and tired of the whole trail, and the two days of doing something completely different, put me back on the right track. And that’s what I love about solo hiking. I could stop and rest, make a day trip off the trail, make silly mistakes but also not feel guilty of making other people pay for them. I embraced my body as it was - and I responded to its needs. Although there were the anxious thoughts (can’t shut them up completely) that there was something wrong with taking so many days off, that it “looked bad”, I managed to overcome it. I could do whatever I wanted, no matter what others might have done in my situation. I loved the time I spent in the hostel. Its owner has a huge garden with oranges and there was a basket filled with them in the kitchen. She also brought me a fresh avocado from her garden. How awesome is that? 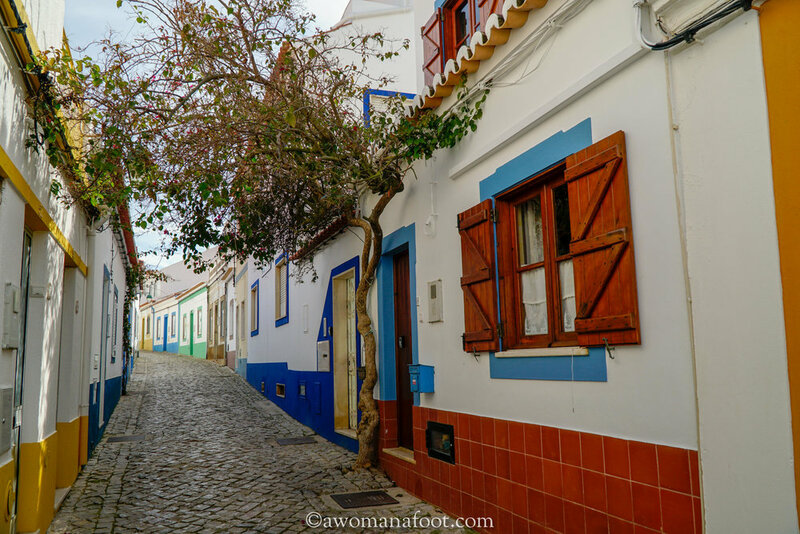 The first day I spent the day walking through Silves and checking out the castle on top of the hill. 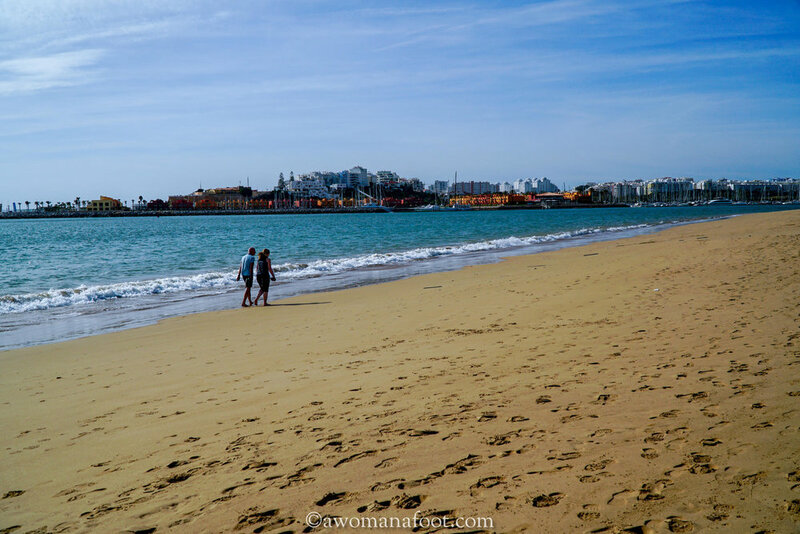 The next day I took a bus to Portimão and then another to a much smaller town: Ferragudo. There is nothing like walking by the Ocean, breathing in the iodine- and salt-filled air, basking in the sunshine to restore one’s spirits. 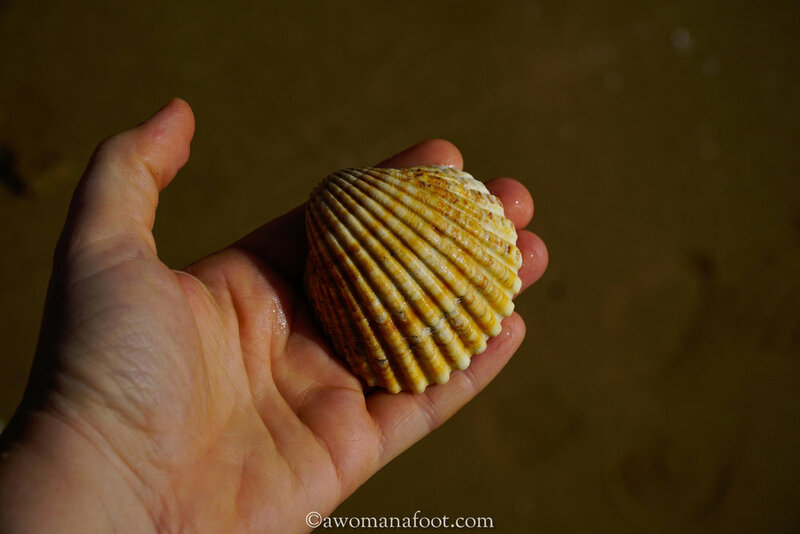 It was the first time I had my feet in the Atlantic Ocean. I won’t pretend I felt in any way different if it were any other sea, yet - it’s fun to know I did something for the first time. I could understand why the Portuguese yearned to reach out beyond their country, to see what’s out there. 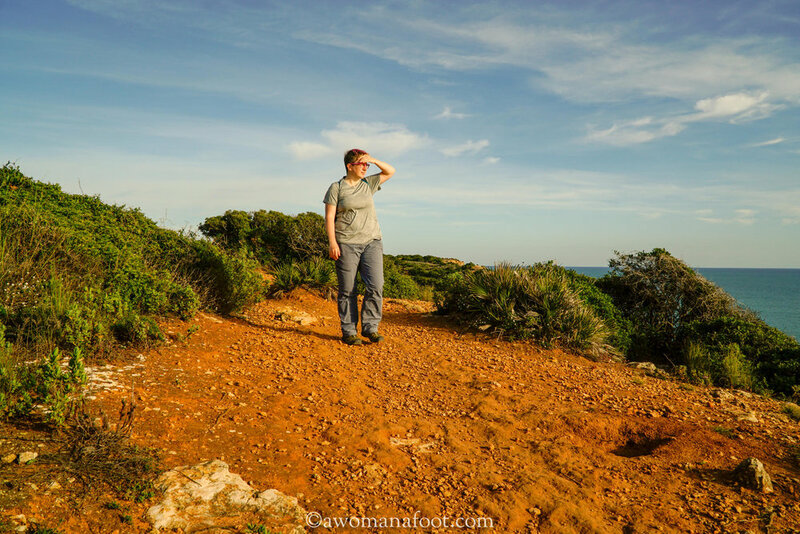 When I came back, there was another woman hiking the Via Algarviana by herself. Her name was Erika and she was from Switzerland. She was also carrying a tent and we chatted for a while about the trail. It was fun to bump into another long-distance hiker on the same path. She loved starting very early on in the morning - quite the opposite to me! The next day she was on her way before I even woke up! Over the two days of “rest” I did about 15 km of walking, and yet, I felt refreshed and ready for the rest of the trail. 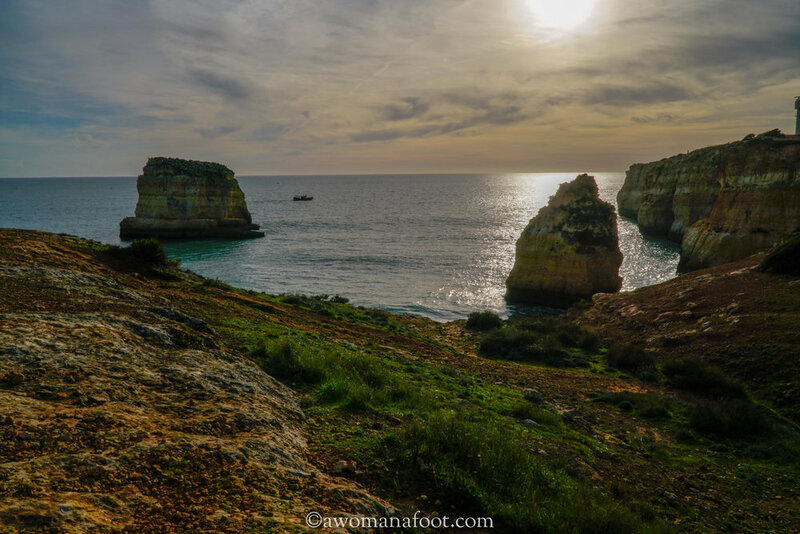 Have you hiked in Portugal or maybe even on the Via Algarviana trail? How was it? How do you like the photos I posted - would you like to hike around such areas?